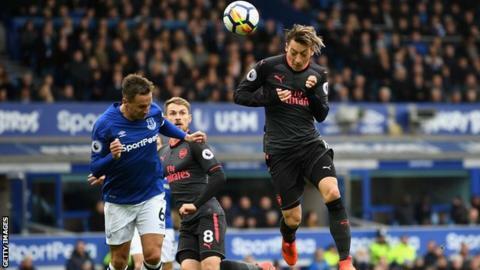 Manager Ronald Koeman says he can turn Everton's fortunes around after they slipped into the Premier League relegation zone with a 5-2 defeat by Arsenal at Goodison Park. Everton were embarrassed in front of their own fans, and have now not won in five games in all competitions. Koeman said the "rumours" about his position are "normal". "The team is underperforming. It is in a difficult situation mentally," the Dutchman said. "That is what we need to change. I still believe I can change the whole situation but everybody knows how it works in football. That is all I answer about this situation so ask somebody else. "It is how you look to the situation. If you start to think negative then maybe there is no solution. I am not like that." With only two league wins this season, Everton were given early hope when Wayne Rooney re-enacted his famous goal against Arsenal from 2002 as a 16-year-old with a brilliant 20-yard curling finish past Petr Cech. It was to prove a false dawn as only Everton keeper Jordan Pickford kept his side on terms before Nacho Monreal reacted to a rebound from his save to draw Arsenal level. Arsenal never looked back and it was no surprise when the outstanding pair of Alexis Sanchez and Mesut Ozil combined for the German to head past the besieged Pickford eight minutes after half-time. Everton collapsed in humiliating fashion, Idrissa Gueye making matters worse when a senseless tackle on Granit Xhaka earned him his second yellow card. Alexandre Lacazette and Aaron Ramsey increased the agony for Koeman and Everton with goals in the final 16 minutes. Even when Everton substitute Oumar Niasse pulled one back in stoppage time, there was still time for Sanchez to end a slalom run with a fifth to bring the curtain down on a desperate day for Koeman, who is now surely fighting to save his job. Is this the end for Koeman? The eerie silence that descended on Goodison Park for the majority of the match was the most ominous symbol of all for Koeman. Goodison Park is normally the most hostile of arenas but the air of resignation was a clear sign how the life and hope has been sucked out of Everton's season after the optimism of that busy and big-spending summer in the transfer market. Goalkeeper Jordan Pickford, who stood alone between Everton and an even more serious beating here, has been a shining light since his £30m summer from Sunderland, and, for all the questions about his signing, Rooney still possesses more class and vision that just about any of his team-mates. Other than that, Everton look a tactical and technical mess, the muddled thinking graphically illustrated by the movable feast - or famine - that is Koeman's team selection. So assured last season, he does not appear to know his best formation or his best team - or, as one wag put it, he does not know his worst team. When Tom Davies replaced Ashley Williams at half-time, it was the ninth time in 17 games this season that Koeman has made a substitution at the interval. This is a telling statistic. Gylfi Sigurdsson, Everton's £45m record signing, looks lost and the swathes of empty seats that Koeman looked out on at the final whistle will also have resonated with major shareholder Farhad Moshiri. Everton are now so rudderless and lacking in inspiration that it is hard to see where Koeman goes from here. Moshiri gave Koeman his backing two weeks ago, but this was such a desperately poor performance that it is impossible to believe he is not revisiting that support. The jeers from the few fans that remained at the final whistle only underlined the crisis that now threatens to totally envelope the beleaguered Koeman. Former Leicester City striker Steve Claridge said "something has to change quickly" at Everton. "On this evidence, Everton are in real, real trouble," he told BBC Radio 5 live. "There were very few redeeming features about their play. There is no belief in what they are doing and they are not good enough to play like that. "There is no reaction to what is going on. The fans have just given up reacting. Apathy is too strong a word but they look like they've had the guts knocked out of them. "The best they could do is get men behind the ball - no balance, no shape, the system didn't suit the players and there was no quality. Arsenal had five and it could have been a lot more." Before the game, Claridge said Koeman should be shown patience. Asked if he had changed his mind, he said: "Yes I have. I am not advocating people leave their job but something has to change quickly." How would Arsenal cope without Sanchez and Ozil? As Arsenal celebrated the easiest of victories at the final whistle, their fans tucked away in one corner of the ground may not have been pondering a thorny question facing manager Arsene Wenger. Alexis Sanchez and Mesut Ozil are both running down their Arsenal contracts and look certain to leave the club, perhaps as early as January, but both produced performances that underlined just how much they would be missed. Sanchez showed no signs of any discontent or hangover from his failed move to Manchester City. The Chile forward was inventive, endlessly aggressive, created one goal for Ozil with a perfect cross and finished of the win with a glorious slalom run and shot across Pickford. Ozil was at his graceful best, picking his way through midfield, selecting the finest from his wide range of passes and ghosting in for a fine header that gave Arsenal a crucial lead they never looked like relinquishing. Arsenal's immediate future hangs heavily on these two players and Wenger may decide it is more palatable to take the long-term financial hit rather than lose what they could give him in the latter months of the season when the January transfer window opens. Could former Everton manager Moyes replace Koeman? Arsenal's character and heart for battle was questioned by Watford striker Troy Deeney after the Hornets' win last weekend, but Everton allowed the Gunners to rebuild their confidence without a hint of trouble. If Everton had taken any note whatsoever of Deeney's message that Arsenal may be frail under the physical exchanges, they did not show any evidence of it. Arsenal strolled around midfield - or what passed as Everton's midfield - almost unchallenged, giving Ozil and Aaron Ramsey free rein to provide service for Sanchez and Lacazette to inflict the punishment that eventually overwhelmed Koeman's bedraggled side. Alexis Sanchez scored and made an assist. He had seven shots on goal and made four key passes for Arsenal. Everton boss Ronald Koeman: "The position in the table is not the position Everton should be in. "Even after today, I see a lot of positives. It is a negative situation for the team - everything is negative - but I am not like that. "We had a lot of expectation after last season. Those expectations are not filling in - that makes the situation difficult." Arsenal boss Arsene Wenger told BBC Sport: "After Wayne Rooney's goal, I thought 17 years later, 'we are here again'. "That was a test for us. We should have been 2-0 or 3-0 up at that stage. It was about how we responded to that - could we keep calm? We did that in a convincing way. Our passing and movement was excellent. "It's very difficult to single out any performances as everyone played very well. It was important to get our first win away from home." Arsenal have beaten Everton more times than any other club have beaten another in English Football League history (95 wins). Arsenal have now scored 100 Premier League goals against Everton, the first time a club has reached the landmark against one team. This is the 20th instance of a manager winning a Premier League game on his birthday and the third time that Arsene Wenger has done this (2005, 2006 and 2017) - more often than any other manager. This is Everton's worst points tally (8) after nine games of a Premier League season since 2005-06 - when they had four points but finished the campaign in 11th place. Since beating Leicester City in September 2015, Arsenal have trailed in 20 different Premier League away matches. This is the first of those 20 games that they have won. Arsenal had 14 shots on target in the match, the most they have managed in a Premier League away game since 2003-04. Mesut Ozil assisted his 43rd Premier League goal. He has more assists than any other player in the competition since his debut in September 2013. Wayne Rooney has now scored 12 Premier League goals against Arsenal, more than any other player. Rooney has scored seven Premier League goals against Petr Cech, more than any other player. Everton visit Chelsea in the Carabao Cup on Wednesday (19:45 BST), before travelling to Leicester in the Premier League on Sunday (16:00 GMT). Arsenal are also in cup action on Tuesday against Norwich (19:45), then host Swansea on Saturday (15:00). Match ends, Everton 2, Arsenal 5. Second Half ends, Everton 2, Arsenal 5. Goal! Everton 2, Arsenal 5. Alexis Sánchez (Arsenal) right footed shot from the centre of the box to the bottom left corner. Assisted by Aaron Ramsey. Goal! Everton 2, Arsenal 4. Oumar Niasse (Everton) left footed shot from the centre of the box to the centre of the goal. Attempt missed. Gylfi Sigurdsson (Everton) right footed shot from outside the box is too high from a direct free kick. Goal! Everton 1, Arsenal 4. Aaron Ramsey (Arsenal) right footed shot from the centre of the box to the bottom left corner. Assisted by Jack Wilshere. Attempt missed. Sead Kolasinac (Arsenal) header from the centre of the box misses to the left. Assisted by Alexis Sánchez with a cross. Attempt blocked. Héctor Bellerín (Arsenal) left footed shot from the right side of the box is blocked. Assisted by Aaron Ramsey. Attempt saved. Aaron Ramsey (Arsenal) header from the left side of the six yard box is saved in the bottom left corner. Granit Xhaka (Arsenal) hits the bar with a left footed shot from outside the box. Assisted by Alexis Sánchez. Attempt missed. Alexis Sánchez (Arsenal) header from the centre of the box is close, but misses to the right. Assisted by Héctor Bellerín with a cross. Substitution, Arsenal. Francis Coquelin replaces Mesut Özil. Attempt missed. Aaron Ramsey (Arsenal) right footed shot from the centre of the box misses to the right. Assisted by Mesut Özil. Attempt saved. Tom Davies (Everton) right footed shot from outside the box is saved in the centre of the goal. Assisted by Ademola Lookman. Substitution, Arsenal. Jack Wilshere replaces Alexandre Lacazette. Offside, Everton. Gylfi Sigurdsson tries a through ball, but Oumar Niasse is caught offside. Substitution, Everton. Ademola Lookman replaces Wayne Rooney. Goal! Everton 1, Arsenal 3. Alexandre Lacazette (Arsenal) right footed shot from the centre of the box to the bottom right corner. Assisted by Mesut Özil. Second yellow card to Idrissa Gueye (Everton) for a bad foul. Hand ball by Sead Kolasinac (Arsenal).